Based in New Haven, Connecticut, Landing are the trio of Aaron Snow, Adrienne Snow, and Daron Gardner, who are celebrating their 15th anniversary summer tour with this 5-song, not quite 30 minute EP, released as a cassette and digital download. Gathering is a dreamy tune with a motorik beat. I like the combination of gentle drift and underlying dense, aggressive noise-drone on Tending and Time. Adrienne’s vocals are hypnotically soothing and recorded and layered beautifully on both these songs. Aaron sings on the remaining tracks and I like how the two trade off vocal duties as both have voices that are complimentary to the music. Cyst is an atmospheric space-pop song that would be a powerful meditative dreamscape even without the vocals and percussion. Two Veils and Sphere II are the heavies of the set, largely due to the commanding bass and rock drumming. Two Veils has a spaced out 80s feel, with a mesmerizing alien synth melody and flowing guitar, but also sparse leads, and an introspective landscape. Sphere II is a remake of Sphere, originally on the 2004 album of the same name. I love the bass/guitar counterpoint… the aggression vs. mind massage dialectic as the bass chugs away while the guitar focuses on tender melodies. Lots of cool space electronics color the proceedings on this one too. 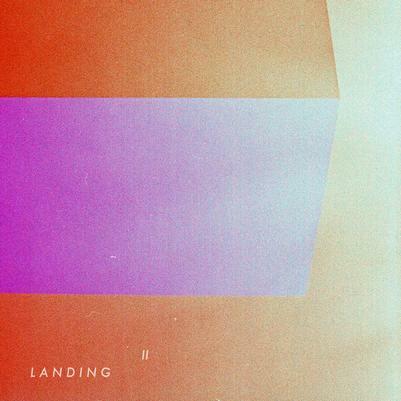 15 years and still going strong, Landing continue to explore Space Rock’s dreamier realms.